This was dessert last night. 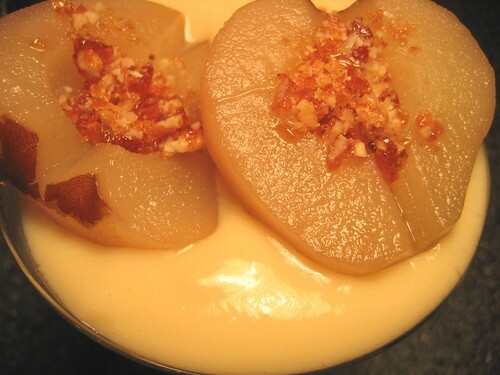 It is pears, halved and poached in a simple-syrup with ginger; sitting on vanilla custard with walnut praline in the cored holes of the pears. I served it in wide Martini glasses (they’re oh so pretty, but so easy to spill your drink out of); and it tasted even better than it looks. I halved and cored four pears (handy hint: use a melon baller to do the coring); and put them in a wide saute pan with one cup of sugar and about four cups of water (enough to cover most of the pears), along with a finger of peeled ginger sliced up. The pears were then cooked over a low heat for an hour, being flipped over every twenty minutes or so. I have a favourite custard recipe (: It’s nice and reliable, so I haven’t investigated others. I use the custard part of this recipe for Mille Feuille; but instead of orange blossom water, I added vanilla essence (I use the Nielsen-Massey Madagascar Bourbon pure vanilla essence. It’s..magical..when the bottle is opened). I covered the bottom of a small saucepan with sugar, and added just enough water to dissolve the sugar. Before you start cooking the praline, it’s important to have somewhere to put it when you’re finished (: Usually, I’d use a silicon baking sheet; but alas, my one has seen better days. Instead, I used a sheet of baking paper inside a roasting pan. This is the caramel cooling zone. I heated the sugar+water over medium heat until it turned amber; then added a handful of walnut pieces. Next, jiggle the syrup around so all of the walnut pieces are covered. Then, pour the caramel on to your caramel-cooling-zone. Give the praline 10-15 minutes to cool down and solidify. Once it has hardened; break it into smaller pieces, then use a pestle (pounding stick from a mortar and pestle) to reduce it down to little pieces. Place the custard in the bottom of glasses. Put the pear halves on top of that. Fill the cored holes with praline.